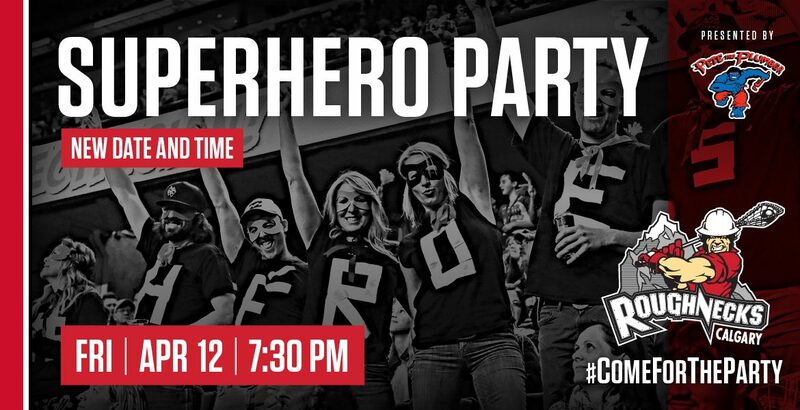 Calgary, AB – The Calgary Roughnecks Lacrosse Club, through the Calgary Roughnecks Foundation, will support the Alberta Children’s Hospital Foundation with a variety of initiatives on Friday, April 12 when they host the Georgia Swarm for the annual SUPERHERO Party presented by Pete the Plumber. Game time is 7:30 p.m. at the Scotiabank Saddledome. The Roughnecks will donate $1 from every SUPERHERO Party ticket purchased along with a portion of 50-50 proceeds collected on Friday to the Alberta Children’s Hospital Foundation. In addition, a group of kids who are currently benefiting from the care at the Alberta Children’s Hospital have been invited to participate as flag bearers in the Roughnecks’ flag tunnel. They will stand alongside First Responders to form the tunnel as players enter the field. A young representative from the hospital will also participate in a ceremonial face-off. The Alberta Children’s Hospital provides the best possible care to over 102,000 children and their families every year. As the official fundraising body for the Alberta Children’s Hospital, all money raised by the Foundation is re-invested in the hospital and child health needs in this region. Not all heroes wear capes but fans are encouraged to come dressed as their favourite caped crusader. Fans will have the opportunity to take photos with Super friends of the Calgary Comic & Entertainment Expo located on the concourse behind section 227. Holy Batman and the Batmobile will also be available on the west tarmac alongside Fire, Police and EMS units. Doors open at 6:00 p.m. for the $5 Happy Hour featuring food and drink specials at all concourse concessions. Single game tickets are on sale for as low as $20 (plus GST and applicable fees) in the Rough House Reserved. Visit Ticketmaster or the Scotiabank Saddledome box office to join the Rough House party. Tickets are also available online at CalgaryRoughnecks.com or by calling 1-855-985-5000. The Alberta Children’s Hospital Foundation inspires our community to invest in excellence in child health, research and family centered care. Through the generosity of donors, the Foundation provides funding for innovative programs, state-of-the-art equipment, advanced medical training and internationally-recognized pediatric research. For more information, follow the Foundation on Facebook at Alberta Children’s Hospital Foundation and on Twitter at @ACHFKids or visit childrenshospital.ab.ca.